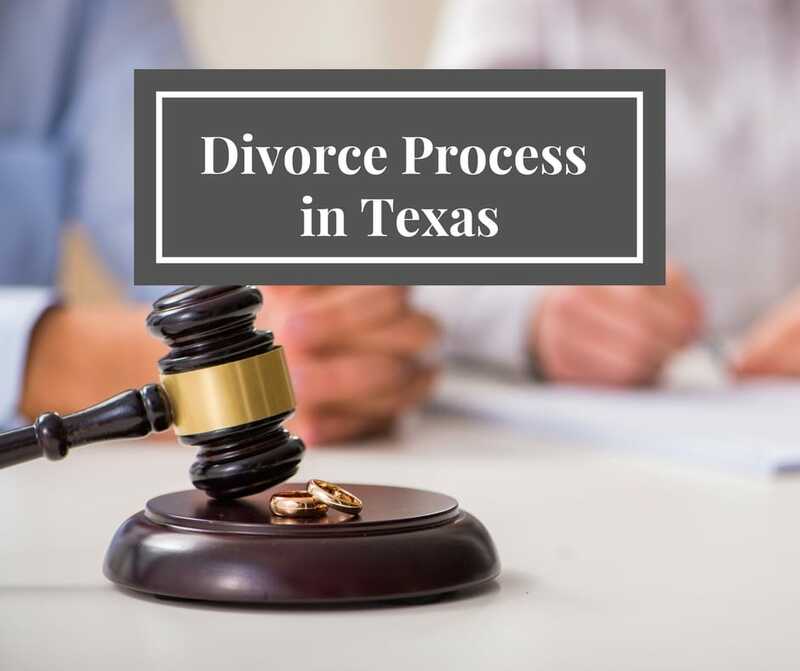 The following outline briefly describes the divorce process as it generally occurs in Texas. It is only a general outline representing the common events of most c ases. It is provided here in order to help you better understand the chronological sequence of a divorce case. Your case may or will be different from the one described below. Divorcing couples usually do “separate” in the sense of living in different households, however. Your actions at this stage can “POINT” the case to it’s final outcome. Take the following two examples. Spouse “A” moves out. Leaving Spouse “B” as the primary caregiver of the kids. Later Spouse “A” decides he or she wants the kids. Courts are very cautious and hesitant to change the circumstances of the children. The Court is not likely to change the status quo. If you choose to leave the family residence, stay active in your children’s life. Keep in mind, that often the possession and access you and your spouse adopt during the separation, is the possession that the Court orders in the divorce decree. Spouse “A” moves out and immediately starts moving the money around-activities that appear to be an attempt to hide or secrete money. Absent some compelling reason, the Court will tend to look with disfavor on this activity. On the other hand, if there is good reason to close bank accounts and credit cards, then do not hesitate to do so. Do not be afraid to take control of the finances. Always protect yourself. If you have joint banking accounts and your paycheck is deposited into it, open a separate account in your name only preferably at a different bank and move the automatic deposit to the new account. The divorce process starts by filing a document entitled “Original Petition For Divorce.” A petition, called a complaint in other jurisdictions, is a formal legal document that sets out the parties, the children, and the requested relief. In a sense is nothing more than a “letter” to the court asking the court to grant a divorce and any other relief requested. It will identify the parties and the children. Furthermore, it will apprise the court of those reasons why divorce is sought, i.e., “discord and conflict that destroys the legitimate ends of the marital relationship, adultery, abandonment, etc. . . .” The person who files for divorce is called the “Petitioner.” The person who answers the divorce petition is called the “Respondent.” The original Petition is served upon the Respondent. Concurrently with the filling of the Original Petition, a party may ask for “Temporary Orders”, “Temporary Restraining Orders”, “A Protective Order”, and/or a “Writ of Habeas Corpus”. Almost all divorced are granted on “irreconcilable differences.” Most petitions will contain “boiler plate” language asking for attorney’s fees, and why a spouse deserves more than 50% of the community estate. Don’t worry about the language. Contact an attorney who specializes in divorce work. The original petition, once filed with a court, is then served upon the Respondent. This is legal notice that a lawsuit for dissolution of the marital relationship has been filed. All parties to a lawsuit must be served. This is a constitutional requirement. It is part of due process. The original petition is served by a process server who is someone who has been authorized by the Texas Supreme Court to serve papers. Process servers are agents of the court who serve the papers on behalf of the court and then file a “return of service” with the court which proves that the Respondent has been served. An alternative method of service is to use a “Waiver of Service.” We, for various reasons, will not generally use this method. Frankly, trying to use a waiver has caused more delays than it was worth. If we represent the Petitioner we will have the Respondent served. Once the Respondent has been served, the Respondent must file an Answer or General Denial to the Original Petition. This document tells the court, essentially, “I want to be heard.” The Answer or General Denial will prevent the Petitioner from defaulting the Respondent. Otherwise, the Petitioner could draft up any decree they wanted and submit it to the court for signature. A default is not good. The Counter-Petition, like an Original Petition, asks the court to grant relief to the Respondent that he/she would not otherwise be entitled unless they asked for it. For example, the Respondent will most likely want joint custody of their children with equal rights and duties. This should be asked for. Or, the Respondent may own separate property. This should be asked for for. In fact, with separate property you either plead it or lose it. All cases require a General Denial filed and all cases should have a Counter-Petitioner for divorce on file. Temporary Orders are orders issued by the court to place immediate controls upon the relationship of the parties, the parties’ financial affairs, and child custody during the pendency of the divorce. Temporary Orders are legally binding. Violation of the orders can subject a party to contempt proceedings. A finding of contempt may result in a fine and/or jail. In some divorce cases, the temporary orders hearing may be the only “court hearing” in the entire case. The balance of the case being worked out by the parties and their attorneys. Temporary Orders can specify who will live in the marital residence, who will be able to write checks on what bank accounts, and who will have primary custody of the children. Temporary orders can be issued voluntarily, by order of the court after hearing, or not at all. A hearing on a temporary order can be a relatively easy short matter, or it can be quite complex requiring multiple days. In Collin County, Texas the parties are strictly limited to 20 minutes per side for a temporary orders hearing – in almost all cases. In Dallas County, if a temporary order hearing takes longer than an 90 minutes a special setting is usually required. If you and your spouse cannot agree on possession and access to your minor children, you will have to move for Temporary Orders. You have a right to be a parent to your children. If your spouse is currently refusing to let you see or contact your children, seek legal counsel. Do not attempt to force possession! Even if it seems like the fair thing to do. You can endanger yourself and your children, as well as jeopardize your right to custody in the future. If your spouse fails to abide by the Temporary Orders, he or she is in contempt, and can be ordered to appear in Court. If he or she doesn’t appear, a bench warrant can be issued, and he or she will be taken into custody. At the contempt hearing, he or she can be sentenced to jail, or have their assets taken to satisfy the Court’s order. The term “Discovery” is a broad general description for a number of legal devices designed to gather information. There are five basic devices which comes under the umbrella of “Discovery.” These devices are Disclosures, Interrogatories, Requests for Production, Admissions, and Depositions. This is not an exclusive list of available tools for the discovery of information. It is only the basic and most common set. Note, in almost all cases some level of discovery is required and will be issued. You must cooperate with your attorney in completing this all important task. If discovery is issued to you, you must answer it or possibly suffer the consequences of a discovery sanction. “A Request for Disclosures” are based upon Rule 194 of the Texas Rules of Civil Procedure. Upon request, a party must give to the other side those items which are set out in Rule 194 within thirty days of the request. The most important thing for the divorce litigant to do for their attorney is list out each and every person that has any knowledge of any facts associated with your marriage and the parenting of your children. List their name, their address, their telephone number and a short statement upon which they know – how they are related to your case. You should start this process, whether or not you have been asked to complete this document, at the outset of your case. A Request for Disclosures should be issued in all cases. Very often, we incorporate it into our Original Petition for Divorce or Counter-Petition. “Interrogatories” are written questions directed to the other party. Each side is allowed one set calling for 25 answers. Notice that the rule refers to answers and not questions. This is to prevent the other side from issuing 25 questions with multiple subparts which might be 40 or 50 answers. “Admissions of Fact” are written declarations of fact directed to the other party asking them to admit or deny an undisputed fact. They are designed to authenticate documents and to dispense with the necessity of proving uncontested or indisputable facts. A common admission might be, “Please admit or deny that the child’s pediatrician is “Doctor Blue,” for example. “Request for Production” is a device used to obtain documents. Upon request, the other party must provide to you any records that you have requested for inspection and photocopying. Sometimes this is a very difficult and time consumptive matter. If the Request for Production is issues, you must answer it. “Depositions” are processes by which sworn testimony is taken from the other party, or witness. It is a discovery device where your lawyer will have the opportunity to question the other side before a court reporter. The testimony taken is admissible for all purposes in Texas. Answering discovery is one of the most frustrating experience both lawyers and litigants can face. The difficulty with answering it can drive the costs of a case up. Save time and money, help your lawyer answer the discovery on a timely basis. Please see our discovery page for more information on this crucial topic. Mediation is process where both parties meet in a neutral setting to discuss their differences, and attempt to resolve the case. The process is controlled by a mediator, usually a lawyer. He or she facilitates the discussions. The mediator’s task is to help the parties settle the case. In Texas it is a required process, and will be ordered by the Court. Usually, by the time all of the events above have taken place, both sides will have enough information, to be able to resolve the contested issues of the divorce without further Court process. Mediation in the divorce, modification, or child custody case can be and is very often essetial to the successful resolution of your case. Mediation has a high probability of bringing your case to a close. If the case can’t be settled, then it will be set for trial. This is the process where both parties present the evidence to the Court for determination. The Court will hear the evidence, examine the pleadings of both parties, and make it’s decision. A trial can be for the court or before a jury upon request. It is exceedingly rare for a case to go all the way to trial. At conclusion of the trial, the parties will draft a “Final Decree of Divorce.” this will reflect the Court’s determination. This document will spell out who gets what property, where the primary residence of the children will be, how the parties are to conduct their relationship as the children grow, and will set child support. The document will attempt to resolve all issues between the parties. In addition, there may be a number of closing documents involved, such as deeds, and automotive titles. Furthermore, a qualified domestic relations order may be necessary if community property is contained in a 401(k), for example. If children were involved in the divorce, the Court’s jurisdiction over the matter continues. It is called a “Court of Continuing Jurisdiction.” The Court’s powers remain in place to enforce it’s decree until your children are eighteen years of age, or otherwise emancipated. You may go back and ask the Court to modify it’s decree, to change child custody, or child support. For a variety of reasons. If a ruling in your divorce is not a fair one, or new evidence has come to light, you may file a motion for a new trial, or begin an appeal.